We are down to the final 10 in Survivor: One World, which until recently was often the time of the merge, where Survivor really began. This season has definitely been a solid one, with equal parts strategy and craziness, the perfect combination for any Survivor season, but we will have to wait to see how this season plays out before giving it a final ranking. Today I will rank the final 10 players in their likeliness to win. This ranking will not be in the order of who is playing the smartest, but who has the best chance of winning. 10. Tarzan-We are at the point where I am pretty sure there is no way Tarzan can win this game. Sure, he will likely make it to the final 3, but if people think you are a joke, there is no way they will hand you a million bucks, admitting that you outplayed them. As much as everyone hated being played by Boston Rob in Redemption Island, they hated losing to Phillip even more and there is no way they would ever hand him a victory. Not only is Tarzan a joke, but he gets on everyone’s nerves and talks condescendingly toward others. That combination=jury goat. 9. Jay-Jay is actually a really smart player. Going in I did not expect to say those words, but I think that next to Kim, Jay has his head in this game. He flips when he needs to flip, keeps his mouth shut when he needs to, and leads when he has to, however, Jay is in a terrible position, which is mostly not his fault. 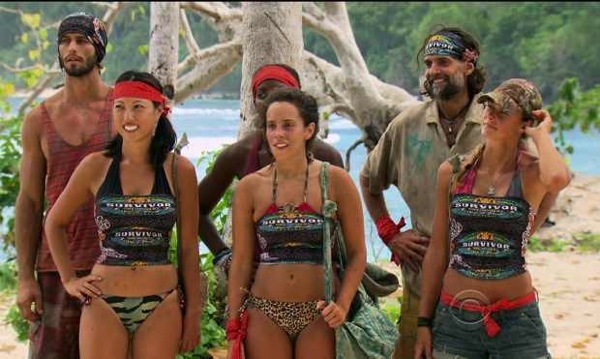 He didn’t want to go to Tribal when the guys gave up immunity, which caused the guys to be down in numbers and now he is facing a 6-4 deficit. Plus he is a HUGE immunity threat, which could make him the next target to go. Unless he wins immunity every time or he can pull off something drastic, he is gone the next couple weeks. 8. Leif-Leif has absolutely no idea how to play Survivor, which might actually help him a couple more weeks. Plus, I could see the girls going after themselves before getting rid of Leif. I just don’t see him being allowed to make it to the finals. He will be voted out once all the bigger threats take each other down. 7. Alicia-Alicia thinks she’s in a better position than she actually is. Though all this could change if she continues to insult people and is seen as a potential jury goat. She seems a little too conniving to be allowed to make it that far though. I think people will be smart and not take her along for the ride. 6. Christina-The girl everyone hates is probably in the most unique position of anyone. Will she continue to be passed along in the voting queue, will she make a move, or will she be taken out 6th? All of these are possibilities considering everyone hates her for little to no reason. Is she so hated that she would lose any final 3? Or could she possibly sneak by as a come-from-behind winner? I could see the editors painting her as someone overcoming adversity and beating those who made fun of her all along, but it hasn’t started yet. 5. Kat-Could she be our Fabio? The “dumb” one who sneaks by, wins some immunities and wins for a lack of backstabbing. However, there are quite a few differences between the two. Fabio was always on the outside of the alliances being made, whereas Kat seems to be in the top 4 of the female alliance. She has been at the center of several important conversations and surprisingly never seems too far out of the loop. I don’t see her overcoming the Sabrina/Chelsea/Kim big 3, but if any of them go after each other she could sneak in. 4. Sabrina-She is in a great spot, but as the out-in-front leader of the girls tribe she is also the out-in-front pick to either win over them or be backstabbed by them. Out of the three I could see her being taken down first. If any of them are smart, they will not let their final 3 consist of the other 2. 3. Troyzan-Maybe Troyzan is a little too high for this list, but he is toward the top of the most capable men out there and is not as high of a target as Jay. Plus he could potentially use his idol to make his way to the finals. 2. Chelsea-Though Chelsea seems to be attempting to completely destroy the girls’ shot of winning this game, I still see her as a favorite to win. Eventually Kim and Sabrina could both be taken down by the others, leaving Chelsea standing as quite the likeable winner. She is a little too hotheaded and doesn’t quite think things through, but if she ends up in a final 3 without Kim and Sabrina she has a good shot at taking it. 1. Kim-Kim is tearing this game a part. There are others who are playing well, but Kim is a step ahead of everyone out there. Not only is she playing a multi-layered strategic game, but everyone seems to have her best interests at mind. During the immunity challenge both Kat and Sabrina were cheering her on. Everyone loves her and thus far she has made no mistakes. Her game and edit almost seem too perfect. Has anyone had this flawless of an edit this far into the game? Earl comes into mind, which is a great sign for her. The only way she goes in the next couple weeks is by an idol and the only way she doesn’t win, is if she takes Sabrina to the finals, or the others realize she is the power player. The only thing is, I can’t see a girls alliance successfully existing without her at the center pushing and pulling each of the chess pieces in her hand.